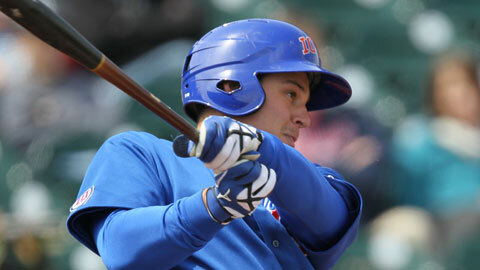 ST. PETERSBURG, Fla. -- Iowa Cubs first baseman Bryan LaHair led Minor League Baseball™ with 38 regular season home runs to win the 2011 Joe Bauman Home Run Award, presented by Musco Sports Lighting. LaHair, 28, will receive the Joe Bauman Trophy and a check for $7,600, representing $200 for each homer he hit, at the Dec. 5 Baseball Winter Meetings™ Awards Luncheon at the Hilton Anatole in Dallas, Texas. The Surprise, Ariz., resident, whose homer total broke the I-Cubs record, was remarkably consistent, going deep 19 times on the road and 19 at home at Principal Park. "I'm a big believer in day-to-day, simplifying it to each at-bat is just as important, and those kinds of things," LaHair said. "It really doesn't matter where I play. I just try to hit the ball hard." Originally a 39th round pick out of St. Petersburg (Fla.) Community College by the Seattle Mariners in 2002, LaHair signed as a free agent with the Chicago Cubs in December 2009. Ian Gac of Winston-Salem and Tulsa's Tim Wheeler finished tied for second in MiLB with 33 roundtrippers. LaHair was named the Pacific Coast League's Most Valuable Player earlier this month.